You thought MS was done with Windows 10 this year? You're wrong! They are still sneaking features into the OS while were all busy feasting. In preparation for the fireworks that Microsoft has in store for us January 21st coming year, I thought to cleanup my desktop install of Windows 10 Technical Preview Build 9879. The build on my desktop has become flaky and unpredictable, most especially around File Explorer and my profile. I was tired of repairing my profile and as I am not sure I can trust the environment anymore with the coming goodies from MS, I decided to spare myself the headache last week and completely reinstalled Build 9879. Wipe and Load if you know what I mean. So we do the usual dance of reinstalling OS, and reinstall apps. Most of my apps were automatically reinstalled last week thanks to OneDrive Sync. 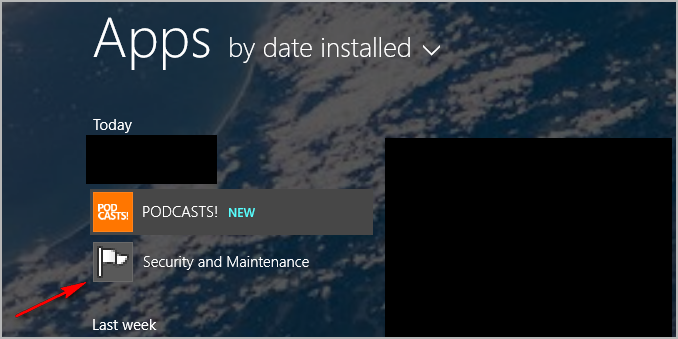 Till this morning when I wanted to load my podcasts and I discovered I didn’t install the Podcasts app. Within minute the App is installed from the Store as above, then I went to All Apps to launch then I saw what you see here above. Something new was sneaked-in today on my system by Microsoft without any fanfare! The Icon is familiar, that is Action Center icon, why are they calling it “Security and Maintenance”, and why does it have to be installed like an app? I did a quick search online, there is no one with this story, I think I might have caught a breaks-xclusive here for you guys. Question now is why now? I thought I heard MS said they are done with Tech Preview changes for this year? Why this change now? What does this mean? Is it because of changes coming to the Notification Center as most of the notifications of Action Center of then are now integrated into Notification Center. Or as the name suggests, they are focusing the features of Action Center now purely on Security and Maintenance. I hope MS will provide more information down the line. I think MS is just preparing us for the big bang in January. As for me, I’m dying of waiting here. Now, can you guys check and confirm this change on your systems too. Curious as to your findings. The notification centre that is on Windows Phone today is called the “Action Centre”. Therefore, the old “Action Centre” in Windows has to be renamed, otherwise there’d be two different things named “Action Centre” in Windows. So yea, that’s why the old “Action Centre” is now called “Security & Maintenance”. The only reason you don’t see the “Action Centre” branding on the notification centre functionality in the Windows 10 Technical Preview is that it’s really early and they haven’t added that naming yet. I wrote this before, but I don’t think it posted, so I’ll try again. Windows Phone today has a notification centre feature that is actually called “Action Centre”. With the merging of Windows and Windows Phone, Windows will also be getting a notification centre feature and it too will be called “Action Centre” to match Windows Phone. Therefore, the current “Action Centre” in Windows has to be renamed, otherwise there’d be 2 features in Windows called “Action Centre” and that would just be confusing. In the current Windows 10 Technical Preview, the notification centre functionality is really early and therefore it doesn’t have the “Action Centre” branding applied to it yet. So yea, that explains why they renamed the current “Action Centre” to “Security and Maintenance”.